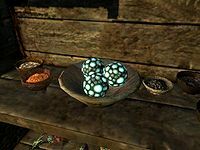 Chaurus Eggs can be harvested from chaurus egg sacs, which can be found in high numbers in all Falmer hives. Chaurus, chaurus reapers, chaurus huntersDG, and chaurus hunter fledglingsDG also have a chance of dropping chaurus eggs. The eggs and sacs emit a pale blue bioluminescence making them easy to spot even in the darkness of caves. This page was last modified on 30 August 2018, at 16:13.